"Microsoft PowerPoint Template and Background with garden path with a stone trail and flowers around" Spread amity with our Garden Path Nature PowerPoint Templates And PowerPoint Backgrounds 0511. Nurture friendships with your views. Your ideas deserve more exposure. Our Garden Path Nature PowerPoint Templates And PowerPoint Backgrounds 0511 will ensure due coverage. 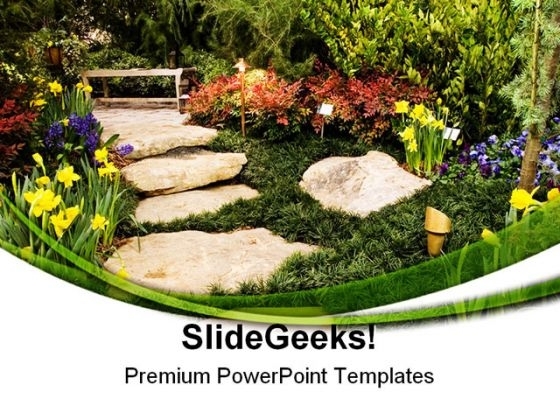 "Microsoft PowerPoint Slide and Theme with garden path with a stone trail and flowers around" Overcome resistance with our Garden Path Nature PowerPoint Themes And PowerPoint Slides 0511. You will come out on top. Our Garden Path Nature PowerPoint Themes And PowerPoint Slides 0511 team are an enduring lot. The further the distance, the better they become.